The National Council of SPCAs (NSPCA) said this week a 350km horse race through the Wild Coast region of the Eastern Cape “should not happen” over concerns that the animals were being exploited and that the vets employed to monitor the animals were not suitably qualified. But the race’s organisers have hit back‚ not just denying the claims made in the NSPCA’s statement but also claiming that the statement’s contents were “very different” from comments made after the race. In a statement on Monday‚ the NSPCA said that it had monitored the “Race the Wild Coast” endurance event‚ which took place from October 16. The race takes four to five days to complete. “Four horses had to be disqualified due to injuries sustained during the race‚” said Arno de Klerk‚ the NSPCA’s special projects manager. “The race organisers had employed six veterinarians‚ not all of whom had equine experience. There were concerns surrounding the conduct of some of the veterinarians which may have impacted on their ability to thoroughly examine the animals. 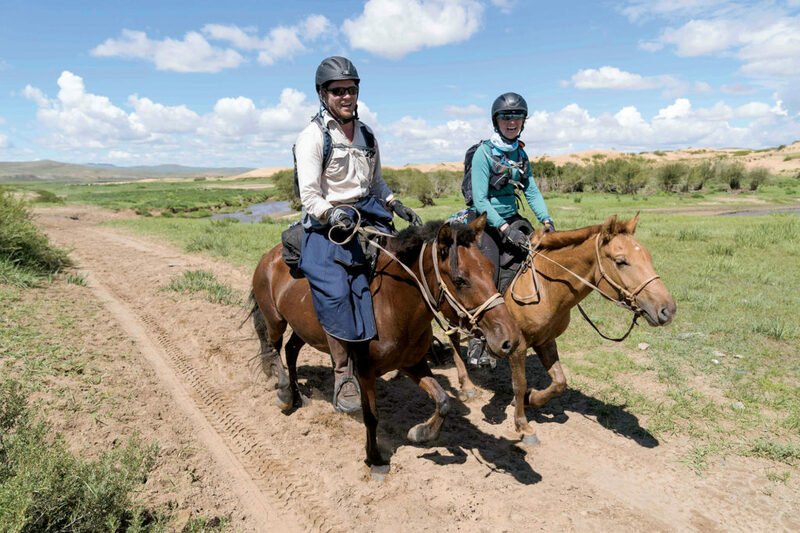 Jocelyn Pierce (right) riding with Michael Turner in Mongolia. Photo courtesy of Mongol Derby. As soon as Jocelyn Pierce finished her first pony ride at the age of 2, she got back in line for another turn. She started riding lessons when she was 4 and had her own horse by the time she was 10. Pierce competed in jumping and dressage events while growing up in Massachusetts and was on the riding team at Otterbein University in Ohio, where she minored in equine science and got a degree in international studies. After moving to Rockville in 2015, Pierce continued to ride as a hobby. An associate editor at Practical Horseman magazine in Frederick, she is immersed in the horse world professionally. This past August, she saddled up for a new challenge: the Mongol Derby, dubbed the longest and toughest horse race in the world. From a pool of about 200 hopefuls, she was one of 44 riders selected for the endurance event, in which riders trek across about 600 miles of rugged terrain in Mongolia over the span of about a week to 10 days. Multiple areas where biosecurity can be improved at events have been identified by the FEI Veterinary Committee. The committee, in its annual report released ahead of the annual FEI General Assembly in Bahrain next month, noted that several outbreaks of equine herpesvirus had occurred during the year and had even led to the cancellation of events. The FEI’s Veterinary Department had monitored the situation with national head veterinarians and other horse industry stakeholders, and had also communicated guidelines. Endurance had the worst record of drug infractions among the major disciplines during 2017, figures show. Drug-testing figures for the various disciplines are contained in the one-page Clean Sport Report, released ahead of the FEI’s annual General Assembly in Bahrain on November 20. Jumping had the most number of samples taken for analysis during the year, at 2517, with 38 positives recorded, which represents 1.5% of all jumping tests. The FEI has announced that there were no doping positives among the 163 horses tested at the FEI World Equestrian Games™ Tryon 2018. Samples taken from two Endurance horses have tested positive for Controlled Medication substances. Controlled Medication substances are those that are regularly used to treat horses, but which must have been cleared from the horse’s system by the time of competition. Human anti-doping testing was also carried out in Tryon, in conjunction with the US Anti-Doping Agency (USADA). There were no positives from 92 samples taken from athletes at the Games. Samples taken on 11 September from the horse Mora Inocente (FEI ID 103TG88/ARG), ridden by Pablo De Los Heros (FEI ID 10017972/ARG) have returned positive for the corticosteroid Dexamethasone. Samples taken on 11 September from the horse El Pangue Ciromagnum (FEI ID 104AV29/CHI), ridden by Raimundo Undurraga Mujica (FEI ID 10063169/CHI), have returned positive for the corticosteroid Triamcinolone Acetonide. Controlled Medication positives at the FEI World Equestrian Games™ (WEG) or the Olympic and Paralympic Games are not eligible for the FEI administrative (fast-track) procedure, so these two cases will be heard by the FEI Tribunal. And, as these cases involve only a single Controlled Medication substance, there is no mandatory provisional suspension of the Person Responsible (PR). Enhanced anti-doping measures were rolled out in advance of Tryon 2018 as part of the FEI’s Clean Sport campaign, with National Federations being offered two types of anti-doping testing so that they could ensure horses were clean: pre-arrival testing (PAT) and elective testing. PAT (available for both the FEI World Equestrian Games™ and the Olympic and Paralympic Games) detects prohibited substances, with no limit to the number of substances tested for. Elective testing is for Controlled Medications only and is limited to four substances. The FEI also launched the FEI Clean Sport Guide in eight languages ahead of Tryon 2018. “Clean sport is an absolute must for the FEI and we are very encouraged by the absence of any positives for Banned Substances and that all human tests came back negative from last month’s Games”, FEI Secretary General Sabrina Ibáñez said. “While of course we cannot overlook the two Controlled Medication positives, overall the outcome is evidence that the awareness campaign conducted prior to Tryon, the opportunity for our National Federations to test their horses before departure and, on the human anti-doping side, our excellent cooperation with the United States Anti-Doping Agency all had a positive impact. During Race the Wild Coast, the constantly changing conditions due to rain and wind on the first two days resulted in frequent alterations to the leader positions. Horse and rider had to work together to overcome obstacles. Young UK-based rider Rosie Riall triumphed as the winner of the second Race the Wild Coast endurance horse race, crossing the finish line at the Kei Mouth ahead of 13 other international competitors to take home the honours. Race the Wild Coast, which is sponsored by international apparel brand KTC and supported by Striped Horse craft beer, is a new breed of long-distance horse racing set along the aptly named Wild Coast of the Eastern Cape. This year’s race was staged from October 16 to 19. Cape Town - Young UK-based rider Rosie Riall triumphed in the second-ever Race the Wild Coast endurance horse race, crossing the finish line at the Kei Mouth ahead of 13 other international competitors. Race the Wild Coast, which is sponsored by international apparel brand KTC and supported by Striped Horse craft beer, is a new breed of long-distance horse racing set along the aptly named Wild Coast of the Eastern Cape, South Africa. The race was organised by South African company Rockethorse Racing, which launched its first event in 2016. This complex, multi-stage race covers 350km of untamed wilderness and includes river and estuary crossings, narrow cliff-top tracks, rocky paths, beach runs, and often adverse weather conditions - earning it the moniker of “the wildest horse race in the world”. From a technical perspective, it is certainly one of the most challenging endurance races in existence. Eliot, a program assistant in the Department of City and Regional Planning, is one of 40 applicants selected from a pool of hundreds for the competition, which pits riders against each other, the elements and the very horses they’re riding. “Mongolia horses are jackhammers. I’m trying to build my leg strength so I can withstand that,” Eliot told The Sun. “It’s scary because a lot of [the horses] probably want to kill me,” she continued. As they navigate the rugged Mongolian terrain — riddled with marmot holes and crisscrossed with rivers — competitors are likely to slip off their horses, which are often already skittish from the unfamiliar riders. Two endurance riders whose horses tested positive to Trometamol have been suspended for six months each – a reduced sanction for a banned substance because Trometamol is being re-classified as a controlled medication. The FEI Tribunal also noted that neither could have known their borrowed horses – supplied by Al Wathba Stables in Abu Dhabi – had ingested Trometamol. It was not listed as an ingredient of a product called “Endurance,” administered by the stables’ veterinary assistant before their respective races. One rider is top Argentinian Daiana Chopita, who rode two horses both testing positive in Abu Dhabi last winter. JC Cahuel placed third in a CEI* 100km race on December 9, 2017, and HLP Gadafi third in the CEI** 120km on December 23rd. The other rider, Waad Nadim Bou Moghlbay, won the December 23rd race for riding JLB Noche, also testing positive to Trametamol. Miss Moghlbay is a Lebanese national competing under UAE administration. World Equestrian Games - Will Tryon Be the Last Edition? It has been much debated, before, during and after the recent World Equestrian Games (WEG) in Tryon, USA, but were those Games, the last? Grand Prix's Sebastien Roullier looks at the issues surrounding the future of WEG. Too expensive, too complicated to organize, not enough publicity: the World Equestrian Games – a fantastic concept on paper – have always sparked debates within the horse sport community. And those who have taken on the challenge of putting them on over the years have rarely managed to deliver a flawless event. While the inaugural edition of the Games in Stockholm, which featured 'only' six disciplines in 1990, and those of Jerez de la Frontera and Aachen, which brought together seven in 2002 and 2006, provided very good and sometimes excellent memories for participants and spectators, that has not been the case for others. In 1994, the organizers of the Games in the Hague went bankrupt. In 1998, those in Rome kept their promises against all expectations but could not host an endurance race, which was relocated to Abu Dhabi. In 2010, the WEG in Lexington, Kentucky were saved by significant last-minute budget infusions – and even then all was not perfect. In 2014, Normandy created a great regional project, but experienced various logistical problems. Not to mention all the organizers, chosen by the Fédération Équestre Internationale, who have thrown in the towel along the way: Paris for the 1994 edition, Dublin for the following and Bromont for 2018. The Tom Quilty Gold Cup is regarded as the ‘premier ride’ and the Australian endurance calendar and is also one of the toughest. Tenterfield veterinarian Luke Annetts has successfully finished the gruelling 160km ride on 10 occasions with his most recent at the annual event in Tasmania on Friday. Annetts and the Glen Innes-bred Churinga Taboo were the fifth heavyweight pairing over the line and to top off their success, received the prestigious best conditioned award in their division. Making the feat even more impressive was the fact the seven-year-old gelding only began his endurance career this year with the longest ride in his career only half the distance of the Quilty. A life-long love of horses is nearing a turning point — but before then, there should still be a few good years of riding for Denise Pascucci and her Arabian steed, Nikea. “I’ve always been around horses,” said Pascucci (pronounced “Pas-KOO-chee”). “I had aunts and uncles who had farms outside Winnipeg, in Vassar and South Junction. I got my first horse when I was 18. “I got the one I currently own on my forty-first birthday, 18 years ago, from Del and Carl Augustine. He’s a pure Arabian and his registered name is Aur Lanii but I call him Nikea. Jaz Hutchins galloped home to cheers, but the tone in the voice of the first to finish the Tom Quilty Gold Cup ride told the true story. After nine hours, 46 minutes and 27 seconds in the saddle, the junior winner on the course near Scottsdale didn’t hide her understandable disappointment. “Yes, I was the first – that’s correct,” Hutchins told The Sunday Examiner in the affirmative, “but it’s a bit disappointing that I can’t take the cup home being a junior. The Sassafras 17-year-old like her contemporaries could not make the mandatory 73kg weight for the cup. The lesser weight over the 160km journey from darkness to sunrise and sometimes beyond is considered an unfair advantage. The 2018 China·Dangshan International Equestrian Endurance Race was held at the International Racecourse of the Old Course of the Yellow River in Dangshan County, Anhui Province from September 27th to 28th. It attracted over one hundred riders from home and abroad and nearly 10,000 equestrian enthusiasts. In the two days, the FEI one-star (87 km), two-star (120 km) endurance races and 48 km and 87 km qualification competitions were held and wonderful equestrian performances were presented. America’s top endurance officials have warned about the “dangerous disconnect” between the extreme flat-track racing over extended distances and the more traditional version of the discipline. They want the United States Equestrian Federation (USEF) to immediately withdraw all funding to FEI endurance events outside of the US for two years or until significant changes are made within the FEI. Funding should instead be directed toward US national events.